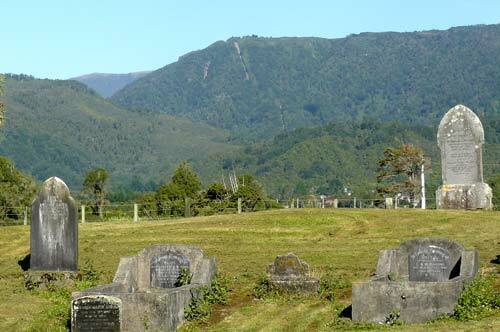 Because the ground was so hard at the mining town of Denniston (on the skyline) coffins were transported down the steep Denniston incline to Waimangaroa, and then taken to the graveyard near the sea. Before there was road access to Denniston, many women spent their whole adult lives there, leaving only when they died. Author Jenny Pattrick gives a vivid fictional account of life at Denniston in her novels The Denniston rose (2003) and Heart of coal (2004). Her heroine, Rose, did not want to leave Denniston, but knew that she would be buried in the cemetery by the sea.